Did you know…Five years ago, we started supporting 13 soldiers with our Mission Soldier Adoption program…and now we’re supporting 1200 troops, veterans, and military families each year! With your help, a difference is being made all over the world…Africa, Afghanistan, Asia, Iraq, Kosovo, Kuwait, Persian Gulf, South Korea, South Pacific, and the United States just to name a few. If it was you…wouldn’t you want something from home while carrying loads of gear in ridiculous heat and nasty sandstorms? Wouldn’t you hope someone would find it in their heart to think of you with a hot brat and cold drink in their hand while celebrating the freedom you’re serving to protect? In the states, we hear blasts and look to the sky for a colorful show. There, they hear blasts and hope their brother or sister’s blood wasn’t just spilled on foreign soil. We have 50 boxes to ship in July…and we need the shipping funds of $672.50 to get these overseas. We have 50 more boxes to go overseas in August and supply the much needed items to make life a bit better for our troops…this cost is $672.50. So, this July 4th, in honor of those willing to donate their blood for our freedom, please consider donating funds to sponsor a box ($13.45 ships one box overseas) and provide a moment of joy to their day…making a difference for a United States Hero. We reach a minimum of 1200 troops/vets per year, with a program cost of $50,000 per year…and no one gets paid…all our services are provided by volunteers. Bottom line…our troops need our help…so right now, WE NEED YOUR HELP. Click Here To Donate Online! + On Purpose Journey Inc. was excited to attend the Boy Scout Event at the Milwaukee Zoo on June 2nd. + On Purpose Journey Inc. was delighted to be invited to the Marcus Center for the Performing Arts Flag Day Celebration on June 14th in Milwaukee. Presentation of Colors, National Anthem, Moment of Silence for POW’s, Keynote Speaker Wounded Warrior Pfc. Alan Jermaine Lewis, Patriot Guard Riders, Fisher House Wisconsin, Quilts for Veterans, 1st Brigade Band-Civil War Brass Band…it was a day to remember. I recently had the privilege to attend a meeting at Thomson Reuters Beta Systems to speak about our mission. They are currently in the middle of a two week fundraising event to send Morale Builder Packages to our troops overseas. To fill and ship Morale Builder Packages, they hosted a pancake breakfast, a spicy lunch, a sausage grill out day, golf, bean bag championship games, bake sales, coin collections, and gift baskets fundraisers. And they aren’t finished yet. I’m sharing this with you so you know that we have amazing souls who support our troops and veterans in our community. And with the 4th of July right around the corner, it was a pleasure to be in the same room listening to how they are working on making a difference. One gentleman said, “I can’t help everyone…but I can help one person.” And that’s what we’re doing…making a difference…hearts united…one hero at a time. 2. Grants: We’re applying for grants…so if your company offers grants to causes you support…please let us know so we can apply for financial assistance to continue supporting our troops and veterans! 3. Donations: We’re looking for companies that are willing to donate gift certificates for our silent auctions. We’re looking for fun experiences to auction to our database…we’ve had tickets for Irish Fest, Summerfest, Wisconsin State Fair, Milwaukee Brewers Baseball Club Tickets, Marcus Center Tickets, and a Green Bay Packers Signed Team Football. If you know of companies willing to donate experiences or fabulous items, please let us know. 4. Financially, we’re in need of funds for supporting our mission. Checks can be written to On Purpose Journey Inc. and yes, we’re a non-profit 501c3 charity. Donations are also accepted online on our website. (Credit card donations are accepted. A fee is charged by the credit card company so we don’t receive the full amount…but we are grateful for all donations!) Click Here To Donate Online! 5. Items: If you like shopping, our July request items now are Graham Crackers; Mini-Marshmallows; Nutella (hazelnut & chocolate spread); Dried Fruit. 6. Help Connecting: We’re looking to connect with: MillerCoors, Harley-Davidson, and the Admirals (hockey)…if you can help, please let us know! 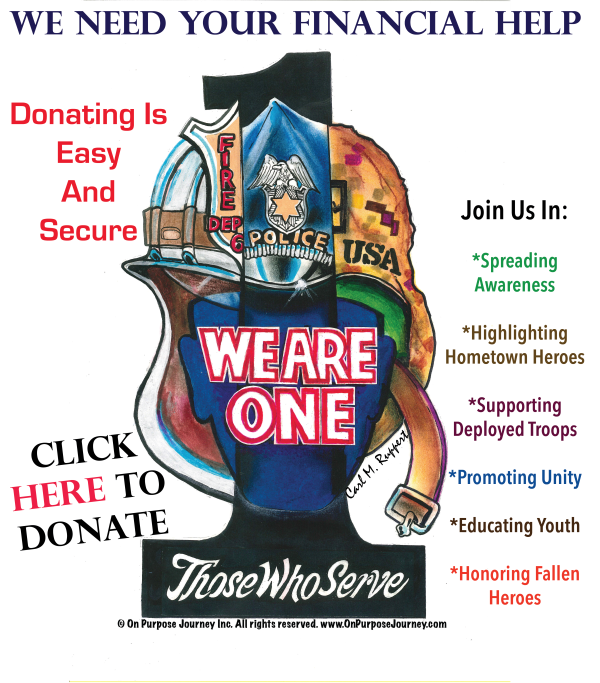 Helping Hearts: Starbucks, Lynn S, Josh V, Linda Lee B, Vickie V, Veolia ES Solid Waste Inc, David W, Susan B, Pam B, Candace C, Susan E, Hayley H, Elizabeth K, Graciela L, and the 128th Air Refueling Wing. We appreciate all of your efforts and support!! We had a nice evening, out to dinner and than to a play at Home Of Next Act Theater for One Time presentation. On the way out I received a nice gift of Pop~Corn because I was a Veteran from your location. THANK – YOU. It capped off my evening really nice. Steve, SGT Special Forces Green Beret. Vietnam/Cambodian 71/72. Thank you. This July 4th…we remember with thankfulness…the reasons behind our independence. Sacrifices we may never know about have been made for us. Lives have been given so we may be free. Minds live with horrors from combat so we can peacefully sleep…so we can choose each day, to use our day for making this world a better place. We have the choice to make our difference. Thank you for choosing to be a part of our mission for the past 5 years. Here’s to living on purpose and continuing to support and add a light to the days of our troops, veterans, and their families.